Advancing the industry through standards. The lack of an international standard applying to structuring manufacturers’ data and making it machine-readable has been a major issue, preventing organisations from bringing forward their digitisation initiatives. 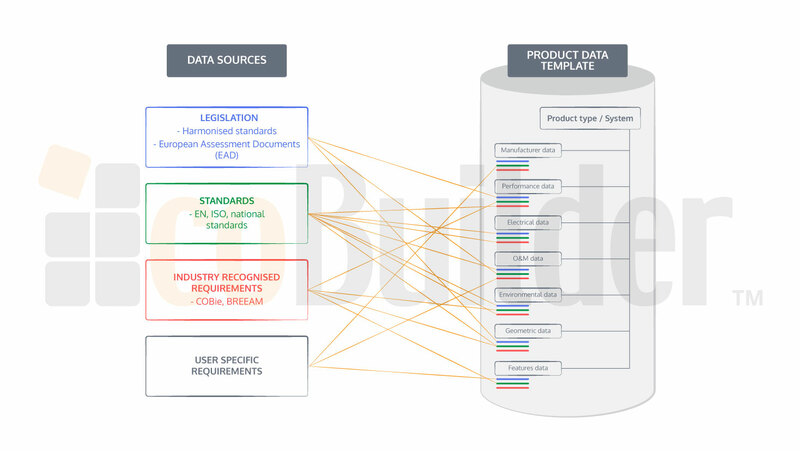 The Product Data Template methodology was created in order to address this problem and is now being further developed by standardisation bodies such as CEN as ISO. Who develops the methodology for creating PDTs? How is a PDT useful for manufacturers? What is the added value of a goBIM Product Data Template? A Product Data Template is a common data structure defining the ‘properties’ (essential and non-essential product characteristics e.g. fire rating and colour) that describe any type of product in a way that can be traced to a credible source. Such credible sources are product standards declaring the performance characteristics of products and the methods they should be tested against. There is a specific hierarchy of credible data sources taken into account in the PDT structure. Legal data sources such as European Harmonised standards are with greater priority than national standards which have greater priority than industry and user recognized requirements (like BREEAM, COBie). This is how Product Data Templates are created to serve as a common framework for anyone to use in order to manage construction product related data. Product Data Templates are especially useful for manufacturers who can populate them with the most up-to-date and accurate information about their products. Once complete, this populated template is called a Product Data Sheet (PDS). A specific Product Data Template can only be a common data structure for a specific set of similar products. This set of similar products is what we call a ‘Product Type’. When a manufacturer digitises their data through Cobuilder’s PDT-based tool goBIM, they can use the Product Type defined by our R&D experts to load the relevant properties for their product. This template carries all standard-based, national and legislative requirements in its structure so that the system will notify the manufacturer if there are missing documents such as the Declaration of Performance in case the PT is covered by the CPR (Construction Product Regulation). Product data templates based on CEN/CENELEC standards in an open European Data Dictionary – Part 2: Framework for product data templates based on harmonised technical specifications under the Construction Products Regulation (CPR), and how to relate the product data templates to Industry Foundation Classes (IFC). Allowing previously siloed manufacturer’s data to enter different digital channels. For further information we suggest that you read our previous article on that topic here. A GOBIM PRODUCT DATA TEMPLATE?